Thecoolestmoviesearch.com is not just a search engine. It is considered a browser hijacker, because the installers it comes bundled with replace the default home page and new tab page with Thecoolestmoviesearch.com. This hijacker cannot be removed using conventional means by entering a new homepage and new tab page in the browser settings. Not only is it forced on you and is difficult to get rid of, but its search results are also unreliable and it may collect information about your browsing habits. We want to provide as much information about this infection as possible, because it is highly untrustworthy. For your convenience we have included a removal guide at the end of this description. Basically, Thecoolestmoviesearch.com is just like any other small-time search engine, and since it is undesirable its developers have turned to deceptive means in order to generate web traffic to it. This hijacker’s developer is called Imali – N.I. Media. This company specializes in web monetization. Therefore, you can encounter promotional links and advertisements in this browser hijacker’s search results. Obviously, its promotions may come from unreliable sources given the fact that Thecoolestmoviesearch.com is distributed using deceptive means. This hijacker is distributed using malicious software installers that usually contain adware and potentially unwanted programs. These kinds of bundles are put up for download on various websites, but they are most often featured on freeware distributing websites or their downloads are promoted by adware programs. 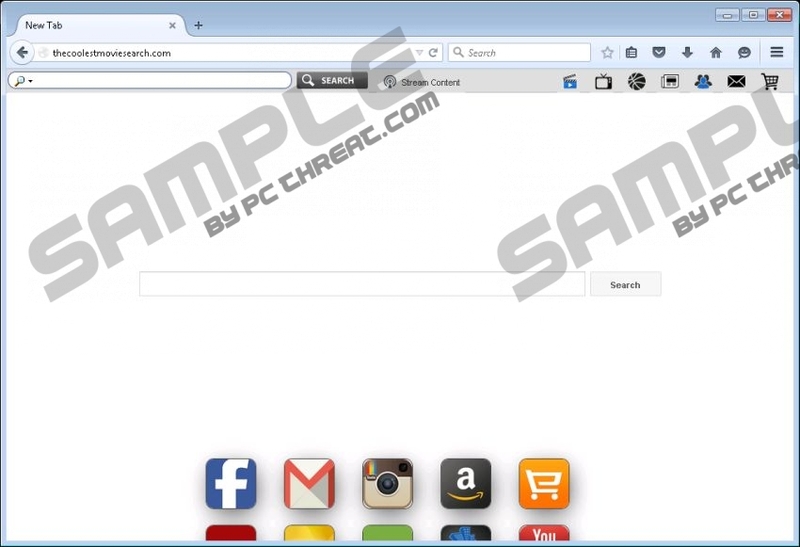 The way this browser hijacker works is pretty simple. As mentioned a malicious software installer will automatically change your browser’s homepage and new tab page to Thecoolestmoviesearch.com. So you are not given a chance to decline the offer to make these changes. Trying to change your browser’s home page or new tab page will prove futile as every time you restart your browser Thecoolestmoviesearch.com will be automatically reset. Now let us take a look at this at Thecoolestmoviesearch.com itself. It features bookmarks to legitimate websites such as IMDB, HULU, CBS, ESPN, CNN, Twitter, and so on, which is all well and good, we do not have a problem with that. However, this website’s License Agreement states that Imali – N.I. Media “at its own discretion and for its causes, include within the Website any links for third party websites, advertisements or links for applications.” but that is not all, there is more to this. Clause 6 goes on to state “Imalimedia does not warrant for Third Party Content or availability thereof nor does it endorse it. Imalimedia shall not be held, or claimed to be held, liable for any 3rd Party Content, its legality or illegality, its adequacy with regulations and its quality.” These are very important issues. So it is quite possible that Thecoolestmoviesearch.com may feature unreliable content and may inflict detrimental consequences on your computer. The information that has been provided above indicates that Thecoolestmoviesearch.com is not a good search engine to have as its developers do not endorse their promoted content. The most obvious argument for removing this hijacker is the fact that is forced on your browser and it is difficult to remove it without additional knowledge. We are here to provide you this knowledge, so check out or removal instructions. Open the browser and tap Alt+H. Open your browser and simultaneously tap Alt+T. Select Internet Options, and then click the Advanced tab. Click Reset and check the checkbox. Quick & tested solution for Thecoolestmoviesearch.com removal.